the new ponies are here! perfectly ponies,sparkle ponies,super-long haired ponies,baby ponies and pegasus ponies. These Mlps are from the butterfly island collection. their pictures have sparkles on them. Very Pretty!!! Ponies from left to right, Seaspray, ribbon wishes and kiwi tart. here are some shimmer ponies. 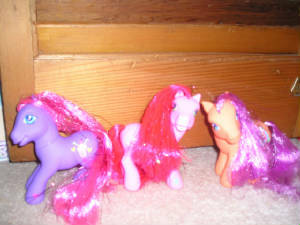 they are called shimmer ponies because thier hair is mostly made of tisel. 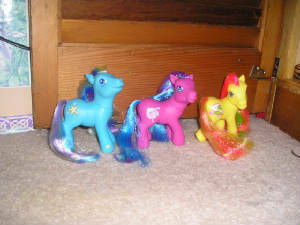 ponies named from left to right, Fizzy pop, Strawberry reefs and Island rainbow. 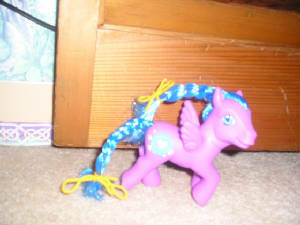 this is my first new design, pegasus my little pony her name is Island Delight.